In this lively ONCLIVE multi-part series of polite debates among four world class CLL experts (Drs. Byrd, Furman, Ma, and Kipps), I was struck by the conservative approach of the panelists to frontline therapy. Almost all the discussion in this 13 minute segment is about chemo-immunotherapy (CIT). Keep on mind that except for patients with 17p deletion where ibrutinib is approved, chemo-immunotherapy is all that is approved for frontline therapy. That said, we all know that many doctors including several on this panel would discuss with their patients other frontline options besides those they discuss on camera, namely FCR (fludarabine, cyclophosphamide and rituximab) or BR (bendamustine-rituximab) or chlorambucil and obinutuzumab. Dr. Kipps points out the potential advantages of the chlorambucil and obinutuzumab in elderly patients with a less resilient bone marrow. This relatively gentle approach has achieved a 20% complete response rate and a 26.7 month mean progession free survival, much better than the other arms in the trial that lead to its approval. For the details of the study published in the NEJM please click on this link. Drs. Byrd and Kipps talk glowingly about the very long term benefits of FCR in a small subset of patients with the best prognostic markers: mutated with no other bad prognostic indicators. This is a subject we have visited frequently visited in the past. Here Professor Hallek and I discussed this topic in this post in the context of the role of chemo-immunotherapy (CIT) way back at iwCLL 2013. I am still waiting for the published material on that low risk subgroup that is looking more and more as if they might be CURED! In this ONCLIVE video, there is also debate on the need to complete all the cycles of FCR to get the full benefit. I fully agree with Dr. Kipps that the evidence suggests getting to MRD (minimal residual disease) negativity is what determines our prognosis and not the number of cycles it takes to get there. I quote from a Blood editorial by Sebastian Böttcher on the original research: "current investigation suggests that the number of treatment cycles also becomes irrelevant as long as MRD negativity can be attained." The full text of the original research is accessible here. The authors state in the abstract that:" MRD-negative patients had comparable PFS ( progression free survival) and OS (overall survival), independent of the number of courses received or interim staging. Early MRD eradication may be a desirable goal, prompting consideration of early discontinuation of treatment." Dr. Furman hastened to point out the potential downside of chemo-immunotherapy and also that the group that did so well is a group that should do well with any therapy. In this article from the British Journal of Hematology, we learn: "patients treated with purine nucleoside analogues (PNA) had a significantly increased risk of subsequent second LPD (5·2%) compared with patients who had not received PNA (1·9%; P = 0·008)" PNA are drugs such as fludarabine and LPD are lymphoid cancers. In fact, they go to stated that the only factor found to be associated with an increased risk of a secondary lymphoma for those us with CLL was prior treatment with chemotherapy. That certainly does give one pause. There is also some very interesting comparison of BR versus FCR, a subject that we extensively reviewed in this prior blog post with Dr. Jeff Sharman. I appreciate Dr. Kipps' careful analysis of the different arms of the trial to ensure that we are really comparing apples to apples. Give a listen and please share your comments. Again, thank you ONCLIVE for bringing us this great panel discussion. 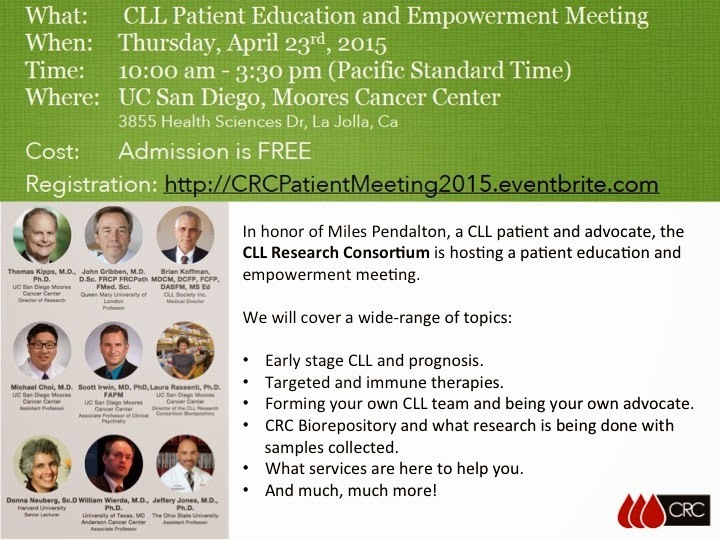 Yes, I will be there as one of the speakers at CLL Patient Education and Empowerment Meeting. But the real draw will be a chance to hear from all the patient friendly experts from around the world. The CLL Society Inc. will also be there and a few hundred fellow CLL patients and caregivers. It is the same weekend as the CLLPAG meeting in Niagara Falls, Canada which will also be a super meeting, so no matter where we live we have no excuse to not become more of an expert in our own disease. With the fast changing understanding about how to treat CLL, we all need to be aware of the very latest options, hopefully predigested for us by the cutting edge experts. 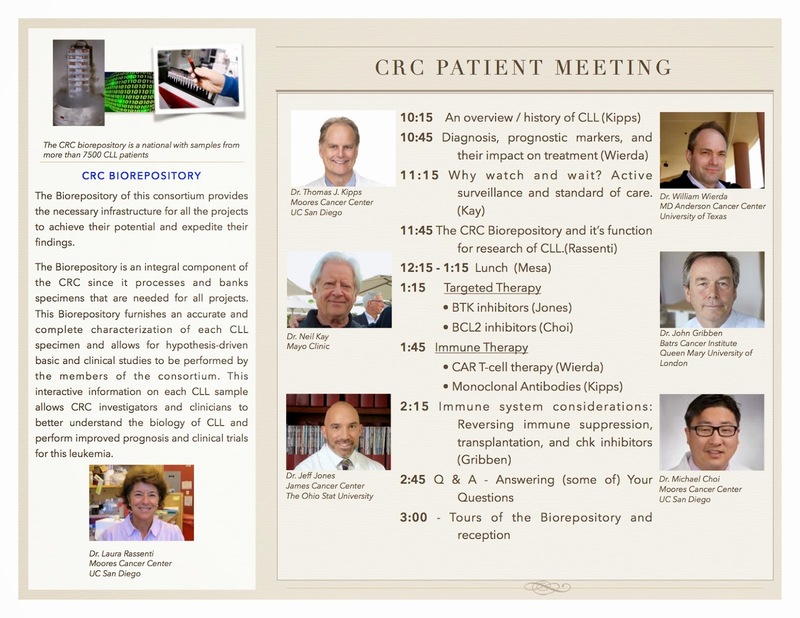 I wish I could be in two places at the same time, but I am very excited about the CRC patient meeting at UCSD. 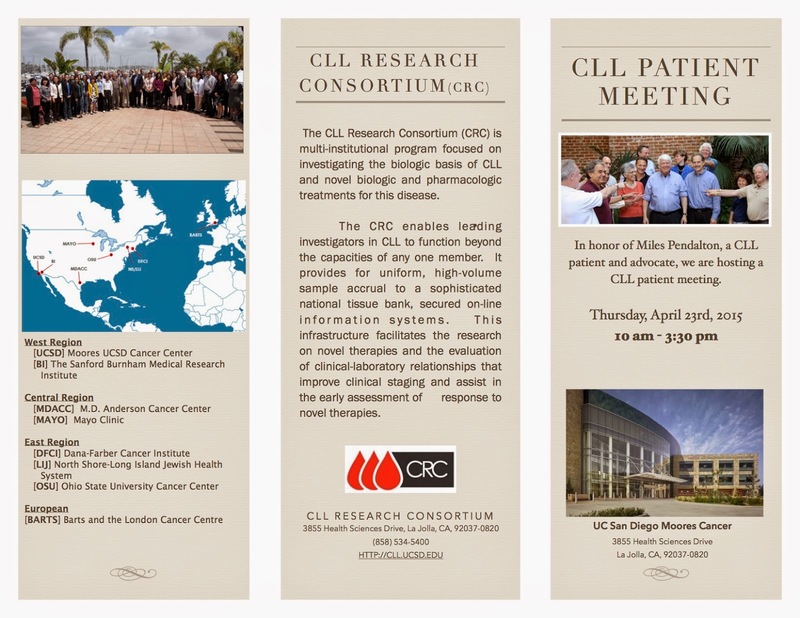 The CLL Society will be staying on to record the news and the latest research from the scientific consortium gathering that follows immediately after the patient meeting. Seating is very limited, so please sign up soon. Marc Summers is ingrained in the minds of millions of fans from his iconic run as host of the kids show "Double Dare." The 63-year-old TV personality and Food Network producer appeared on the Preston & Steve Show on 93.3 WMMR this week to talk about something much more serious. After spending the weekend with the radio show's hosts at an event called "Striking Out Cancer," Summers said, "I'm sort of old school and keep things to myself ... I've been sort of keeping something secret for the last five years." "I was diagnosed with cancer five years ago. In show business, if you talk about that stuff, it's hard to get hired afterwards. My agent said, 'Well, don't talk about it.' I've sort of compressed this thing and it's made me nuts," he said. "I wanted to tell somebody and I didn't know who to tell. I was on this show 'Oprah: Where are They Now' and I almost did it there." Summers was diagnosed with chronic lymphocytic leukemia. "I was having stomach problems and in severe pain, went to a hospital and they took 17.5 inches of my small intestine out," he said. Summers said when he woke up he made a joke, "Hey doctor, do I have cancer?" and he replied, "As a matter of fact, you do." The reason he's talking now is that his first doctor wanted to "blast" him full of chemo and radiation and he wanted a second opinion. On that visit, he was told he had just six months left. "He said, 'You have six months, get your papers ready,'" Summers said. "I was freaking out." He thought he wouldn't get to see his kids married and that he was going to die. But he called the first doctor and he shut down that theory. The first doctor called the second and that doctor denied giving Summers the death sentence. He got a third opinion, then "was in chemo" for two years with a doctor, whom he said changed his life. "The first chemo was brutal, as I think they all are," Summers said. "This past December, I finally got the all-clear sign." Now, he wants to share his story of remission and is "ready to move on." Be warned that the video does have some mildly risqué language. There are so many things wrong with this story, I almost feel it's as if it is one of those WACKY WEDNESDAY cartoons where you need to pick out all the problems. Chemotherapy? Seems he had rituximab which is a biological immunotherapy, not really chemo. His first doctor wanted to "blast him full of chemo and radiation" and a second told him that "he had just six months left? "That is so scary that it doesn't even deserve comment. Good on him for getting a third opinion. PET scans yearly time five years? No indication for CT scans most of the time in CLL, let alone a PET scans. Cured with single agent rituximab? That would be a miraculous and publishable result. Cures in CLL to this point have only be possible with a high risk bone marrow transplant. Which brings me to the last and least concerning point: understandable confusion re: bone marrow biopsy versus bone marrow transplant. To his credit, Marc did help straighten that out. Since he seems that he never saw a true dedicated CLL expert, I have to wonder if he ever had a FISH test and whether he ever really needed treatment. It would make sense that his disease profile was pretty indolent to respond so dramatically to only rituxan. But there also are some excellent lessons from this cautionary tale. The biggest take away message is that we all need to get a second and sometimes a third opinion. And we must always be our own strongest advocates and push to get the best possible care. And I do so appreciate Marc Summers coming out of the cancer closet. I understand why it made sense for him to keep quiet when in show business, but that's a bit sad that we live in such a prejudiced world. We find out about most celebrity's CLL in their obituary, so I salute his bravery and the good work he is doing getting the word out. This second OncLive video with Drs. Byrd, Furman, Kipps, and Ma was actually the first, the lead-in to my prior post. In fact the last few minutes of this video are the first few minutes of the video with the same doctors seen on my the recent post discussing ibrutinib. Obinutuzumab is a powerful antibody directed against CD20 as is rituximab and ofatumumab but it seems to promise better responses as part of a therapeutic combination at least in some circumstances In this case when used with chlorambucil (a gentle form of chemotherapy or alkylating agent similar to cyclophosphamide, the C in FCR), it clearly delivered significantly deeper and longer responses than the other arms of the trial. While the video session is clearly aimed at the oncology doctors, and our eyes may glaze over when there is a detailed discussion concerning the choice of the best steroid to use to abrogate the potential severe infusion reactions associated with this potent antibody, it is worthwhile to listen and catch the data on obinutuzumab. It is nice to listen the experts for once discussing the real world concerns about cost and insurance. It is also good to hear Dr. Kipps point out the critical role of the infusion nurses in keeping us well and safe. Here is the results from the abstract published in the NEJM with Valentin Goede as the lead author. It is a study that randomized patients to one of three possible therapies: chlorambucil alone, or combined with either rituximab or with obinutuzumab. The trial patients were all untreated and would generally be considered to be too sick due to renal disease or other problems to risk more robust chemo-immunotherapy such as FCR. Please note that the impressive 10 month improvement in the mean progression free survival noted with obinutuzumab–chlorambucil compared to rituximab- chlorambucil. Comparison to chlorambucil monotherapy is not helpful as it is rarely used this way in the USA because of its known lack of efficacy. CIRS score is a marker of the degree of co-existing illness. It is important to remember that a benefit demonstrated with one combination is no guarantee that the antibody would demonstrate a similar benefit in any other combos. Assumptions can be dangerous in cancer care. I am waiting for the published data that Dr. Kipps that show the results of the combination bendamustine and obinutuzumab. Lastly, what we all really want (if we can't get a cure) is a durable remission. The mean progression free survival was a little over two years (26.7 months) for the mostly elderly treatment naive patients. Is that enough for you? Two years is nice respite, especially for a pretty gentle therapy used in a delicate population, but I wanted a longer time before half the group had to live with the reality of their cancer progressing again.